For the North American or Australian spin-offs, see Virgin Festival or V Festival (Australia) respectively. V Festival, often referred to simply as V Fest or VF, was an annual music festival held in England during the third weekend in August. The event was held at two parks simultaneously which shared the same bill; artists performed at one location on Saturday and then swapped on Sunday. The sites were located at Hylands Park in Chelmsford and Weston Park in South Staffordshire. It was announced by Richard Branson on 30 October 2017 that V Festival would be discontinued but that a new festival would replace it. In 2018, a new festival called "Rize" was held in on the same weekend as the "V Festival" but only at Hylands Park. The "V" represented the Virgin Group, with the event being sponsored by Virgin Media. It was originally televised by Channel 4 from 1997 to 2013, predominantly on their sister channel 4 Music. It was then televised by MTV from 2014 to 2015, and the 2016 edition of the festival was televised by Channel 5. The idea for V came in 1996 when Pulp's front man Jarvis Cocker said that he would love to play two outdoor venues in two days. Pulp's promoters got together and came up with the idea of putting the gig into Victoria Park Warrington and Hylands Park Chelmsford giving fans in both the North and South a chance to see the band. Then came the idea of adding more bands to the bill, putting on a second stage and letting people camp for the weekend. In the end Victoria Park was just too small for 3 stages and camping. So in August 1996 there was one day of artists in Victoria Park and 2 days at Hylands Park with camping. The northern leg of V97 was switched to Temple Newsam, Leeds to provide room for camping and three stages. In 1999 the Northern leg of the festival was moved to Weston Park in Staffordshire, and has remained there since. Previously it had been held at Temple Newsam in Leeds, before being replaced by Carling's Leeds Festival. Originally, the festival took the name of the current year, with the first festival being named "V96". Since 2003 it has been known as simply the V Festival. Its weekend format, low queuing times and professional organisation have given it a loyal audience. The festival sold out in record time in 2006. Mel C, Dido, and N.E.R.D. have all performed at the festival, and both Razorlight and Faithless performed in 2006. V showcases a mix of British and international musicians, from up-and-coming bands such as Coldplay in 2000 and the Kaiser Chiefs in 2003 and 2008, and glam rockers El Presidente in 2005, to veteran crooner Tony Christie. Girls Aloud also performed at the 2006 show, and received rave reviews for their performance. V97 was the first V Festival to be webcast. This was audio-only, and had about 30,000 unique listeners. The first V festival took place on Saturday 17 and Sunday 18 August 1996, and had two stages and one tent. This year introduced the NME stage. Richard Ashcroft (of The Verve) goes solo and Travis unveil their cover of Britney Spears' "...Baby One More Time" which they had already played at Glastonbury Festival in June 2000. The 11th V Festival took place on Saturday 19 August and Sunday 20 August. Tickets for the festival went on sale on Monday 27 February, exclusively to Virgin Mobile customers, and went on general sale on Friday 3 March. There were complaints from festival-goers in 2006 due to the excessive price of food and merchandise, and lack of prior information about the band schedules, the only timetable available being a programme sold at the festival. Despite knowing the numbers attending, the print run of programmes was sold out. The "Road To V" competition for 2006 was won by Bombay Bicycle Club and Keith. The line-up for V Festival 2007 was revealed on Virgin Radio on Monday 26 February 2007 and tickets went on sale on 1 March. V Stage: The Killers, Foo Fighters, Kasabian, Snow Patrol, Vulcan, James, Pink, The Fratellis, Kanye West, KT Tunstall, Paolo Nutini, James Morrison, Editors, The Goo Goo Dolls, The Proclaimers and Just Jack. Channel 4 Stage: The Kooks, Manic Street Preachers, Lily Allen, Mika, Guillemots, The Hours, Basement Jaxx, The Coral, Babyshambles, Jet, The Fray, The Cribs and Captain, as well as Road To V winners Rosalita and The Brightlights. Foo Fighters also performed an acoustic set under the name 606. JJB/Puma Arena: Damien Rice, Corinne Bailey Rae, Iggy Pop & The Stooges, Lemar, Willy Mason, Rilo Kiley, McFly, Sophie Ellis-Bextor, Mutya Buena, Seth Lakeman. Primal Scream, Happy Mondays, Jarvis Cocker, Ocean Colour Scene, Dizzee Rascal, Sinéad O'Connor, Beverley Knight, Martha Wainwright, Glenn Tilbrook & The Fluffers, Jesse Malin and Chungking. Virgin Mobile Union: Graham Coxon, Robyn, Stephen Fretwell, Bedouin Soundclash, Air Traffic, The Rumble Strips, Remi Nicole, Cherry Ghost, Tiny Dancers, Unklejam, Passenger, The Dodgems, Rodrigo Y Gabriela, Boy Kill Boy, Plan B, The Holloways, Mr Hudson & The Library, Mumm-Ra, Switches, The Wombats, Ghosts, The Hoosiers, Pop Levi and Rebecca. Amy Winehouse was supposed to play but cancelled due to admittance into rehab. She was replaced by Happy Mondays. Babyshambles were four hours late for their set at Weston Park after being held up by traffic. Robyn replaced The Bravery. Tickets went on general sale on 7 March 2008 at 10 am, and sold out in 90 minutes. On 26 June 2008 at 10 am, extra tickets for both venues went on sale. Tickets for V 2009 went on general sale on 6 March 2009. A limited number of tickets went on sale at 10 am on 19 August 2008, following the end of the 2008 festival. Weekend tickets were priced at £132.50 (no camping) and £152.50 (with camping) for the weekend. On 2 March 2009 NME confirmed The Killers and Oasis as headliners. However, Oasis did not perform in Chelmsford due to frontman Liam Gallagher having viral laryngitis. Oasis split-up as a band just weeks later, making their Staffordshire show their last. The event was held on 22 & 23 August 2009. The 2010 lineup for V Festival was officially announced on 11 March 2010 through the festival's site and on Absolute Radio. The headliners for both days were Kings of Leon and Kasabian. Tickets went on sale on 5 March 2010 at 9 am, with Virgin Media customers pre-sale tickets being available on 2 March, and Essex residents tickets being available on 4 March from 9 am. General sale tickets became available at 9 am on 5 March 2010. Organisers said they sold out in record time, just one and a half hours. Cheryl Cole was supposed to headline the Arena but had to cancel due to Malaria. Line Up according to the official V Festival programme. Pendulum headlined the 4Music stage but Primal Scream closed the stage. The final line-up for V Festival 2012 was announced on Tuesday 7 August. In contrast to previous years, some tickets remained on sale until the week of the festival. Nicki Minaj cancelled her appearance at this weekend's festival because of damage to her vocal cords. LMFAO was moved up to headliner spot whilst DJ Fresh performed in LMFAO's place. In the week running up to V Festival both Frank Ocean and Dappy were removed from the line up due to undisclosed reasons, they were replaced by The Charlatans and Wiley. Performers such as Sean Lock and Milton Jones appeared in The Glee Club Comedy Tent. At the 2013 V Festival, Beyoncé made only her second and third European festival appearances of the calendar year. The other main stage headliner was Kings Of Leon, with headliners on other stages including Jamie Cullum, Basement Jaxx and former Swedish House Mafia DJ Steve Angello. For the 2013 festival, one stage was renamed: the stage previously known as 'Virgin Media Undercover Tent' now became known as 'Futures Stage'. A poster released by the organisers initially seemed to suggest that the stage previously known as '4Music Stage' had been renamed as 'Stage 2', leading to speculation that Channel 4 had ended their sponsorship of the event, however a revised version of the poster released later reinstated the original name of the stage. Multiple changes were made to the bill in the days leading up to the festival. Beady Eye were scheduled to headline opposite Beyoncé on the 4Music Stage, however they had to cancel all live shows through August 2013 because of the hospitalisation of member Gem Archer. Thus, their headlining slot on the 4Music Stage was taken over by Steve Angello, whose own previous headlining slot on The Arena Stage was taken over by Ocean Colour Scene. Ocean Colour Scene had themselves previously been scheduled to play an earlier timeslot on the main stage on the opposite day - that slot was taken over by Scouting For Girls, whose previous slot on the 4Music Stage was in turn taken over by previously-unannounced act Reverend and The Makers. In unrelated developments, Little Mix were removed from the line-up for undisclosed reasons, and their fellow The X Factor winner James Arthur also cancelled his appearance the very day before the festival, citing a throat infection. Finally, on the official V Festival lanyard offered to festival attendees upon their arrival on site, it was confirmed that four previously-unannounced acts had been added to the Futures Stage - these were James Bay, Hero Fisher, Gamu Nhengu and Paul McCartney's son James McCartney. The 2014 V Festival was the first to be staged with the new shareholders Live Nation and new broadcaster and sponsor MTV, took place over the weekend of 16–17 August 2014. The main stage headliners were Justin Timberlake and The Killers, as announced at 8pm on Monday 3 March 2014, with tickets on general release the following Friday morning. Other high-profile bookings included Paolo Nutini and Ed Sheeran, who had between them released the two biggest-selling albums of the year up to the festival, and festival debutants included Chic featuring Nile Rodgers, Janelle Monáe and Kodaline. Manic Street Preachers had to cancel their show at Chelmsford due to being delayed in Budapest, Hungary at the airport after the Sziget Festival. Most of the line up was released on the 22 February 2016. The 2017 V Festival Line Up was announced on 31 March 2017 with more acts added on the 2nd April 2017 and the full lineup poster on 20 April. The festival has been noted for its commercial nature in comparison with other British music festivals. V Festival has received criticism for charging £10 to buy a programme - the only way festival-goers can see what time artists are performing - while others have mentioned the fact burgers cost £7 and water bottles are sometimes confiscated at the entrance, costing up to £2 once inside the grounds. Buying four crates on site would cost a person the same price as a ticket. Some fans have referred to the organisers of the event as 'greedy'. "Yet there are undeniable advantages to the [commercial] environment. V is a remarkably non-threatening festival, with few of the rougher edges prevalent at other large-scale gatherings." The Evening Standard gave the 2009 festival 3/5 stars after headliners Oasis pulled out of the Hylands Park leg of the festival due to illness. Furthermore, approximately 800 people were injured, mainly due to falls causing sprains and ankle injuries. In 2012, during Cher Lloyd's performance, the crowd booed and a bottle filled with urine was thrown at her, causing Lloyd to walk off stage. She came back on to finish her set but another bottle was thrown and she ended her set early. ^ Buckland, Lucy (30 October 2017). "V Festival has been scrapped after 22 years - boss Richard Branson announces". mirror. Retrieved 30 October 2017. ^ "Festival fans condemn 'greedy' V". BBC News. 22 August 2006. ^ NME.COM. "Babyshambles V Festival Stafford set delayed - NME.COM". NME.COM. ^ NME.COM. "Babyshambles finally play V Festival Stafford - NME.COM". NME.COM. ^ "BBC NEWS - Entertainment - V tickets sell out in 90 minutes". ^ "Blue and The Saturdays to headline V Festival". NME. 3 March 2009. Retrieved 2 March 2009. ^ "Oasis cancel V festival Chelmsford headline slot | News". Nme.Com. 23 August 2009. Retrieved 20 May 2014. ^ "V Festival tickets sell out fast". BBC News. 6 March 2010. ^ "MINAJ CANCELS UK FESTIVAL SHOW DUE TO VOCAL CORDS". AP. Retrieved 19 August 2012. ^ "Line-up". Vfestival.com. Retrieved 20 May 2014. ^ "Beyoncé's blonde bob makes stage debut but manages to cause controversy by refusing cameras to film her live set at V Festival". Daily Mail. London. 17 August 2013. Retrieved 19 August 2013. ^ Brown, Helen (17 August 2013). "V Festival 2013: day one review". Daily Telegraph. London. Retrieved 19 August 2013. ^ Hawksley, Rupert (18 August 2013). "V Festival day two: Kings of Leon, Stereophonics, Emeli Sandé, review". Daily Telegraph. London. Retrieved 19 August 2013. ^ "Manic Street Preachers pull out of Chelmsford V Festival". BBC News. Retrieved 16 August 2014. ^ "Cher Lloyd walks off stage at V Festival after a reveller throws bottle of urine at her". Daily Mail. London. 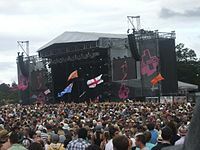 Wikimedia Commons has media related to V Festival.